1. Went to Portsmouth. Went walking on the seafront, and went to the D Day museum and had a good look round the exhibition and the Overlord Embroidery. Spent a good chunk of time sitting in my very favourite spot in the world: Castle Hill, soaking up some surprise bank holiday sunshine. 2. Participated in a charity pub quiz organised by Mother Hand. We came 5th. We were told we weren't allowed to win, in case it looked like a fix - but I don't think we were ever close. 3. Caught up with my friend Graham, who came to make up the team for the quiz. We used to work together as silver service wait staff in Portsmouth when I was at school, making him one of my oldest friends. He usually reminds me of the time I was sitting on the floor resting in a lull at the Royal Sailors' Home Club and the French Maitre d' came over and started telling me off, "Zees ees not Greenham Common! Get up!" 4. Went to see Angels and Demons at the pictures with Mother Hand. A million times better than the Da Vinci Code - but then I rated the book much higher, too. Must have been Dan Brown's first: some people only have one good book in them, I think. Really want to go to Rome now. 5. Booked our flights to the US this summer. The price had come down by almost £100 per ticket so I went for it. 6. Booked one Californian campsite, and found two others and a nice motel. The only reason I haven't booked those too is because I can't be bothered to walk downstairs and get my credit card. 7. Started knitting a new top, in a lovely petrol blue bamboo yarn I bought 10 balls of in a Get Knitted sale. Irritatingly, I got gauge on the recommended needle size when I swatched, but then when I had cast on the 131 stitches and knitted 5 rows I realised my gauge was WAY off and had to rip back. This yarn is about 10 plies and gets looser with every rip so it hasn't been fun reknitting the first bit. It's lovely and soft, though. 8. Went to see Cheri at the pictures with Parpy Jo. I liked the first half but not the second. The sets and costumes were beautiful, and gave me some ideas for the art deco lounge I hope to have one day. 9. Taught my LAST EVER HORRIBLE WEDNESDAY! The next one will be after the year 12 exam and so even if I have to teach all 6 lessons, the last 2 can be something like a video. I really hope I don't have a 6-lesson day on my timetable next year. I never got round to posting last weekend's FO because we didn't taker any good pictures until this week, so I have a couple of things to share this week. 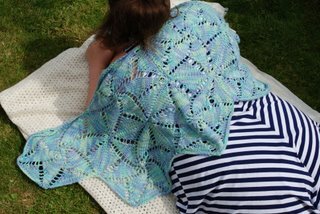 Mods: I didn't like the layout of the cape, so I knitted 10 pinwheels instead of the suggested seven and stitched them into a more traditional shawl shape - a big V.
It's so lovely, I can't stop looking at it. And until I put this dress on for the pictures I was planning to knit a little red cardigan to wear with said dress for friend's wedding in 3 weeks - but now I think I might just wear this shawl instead. The additional bonus to this is that I'd have to purchase a new pair of shoes. And maybe even a bag. This shawl reinforced the magic of blocking to me. The pinwheels were curled up and looked very unpromising to begin with, so I pinned them out and lightly steamed them with an iron before sewing them together - semi-magic - and then pinned the whole shawl out and steam blocked it toroughly using my favourite wet towel/iron method. 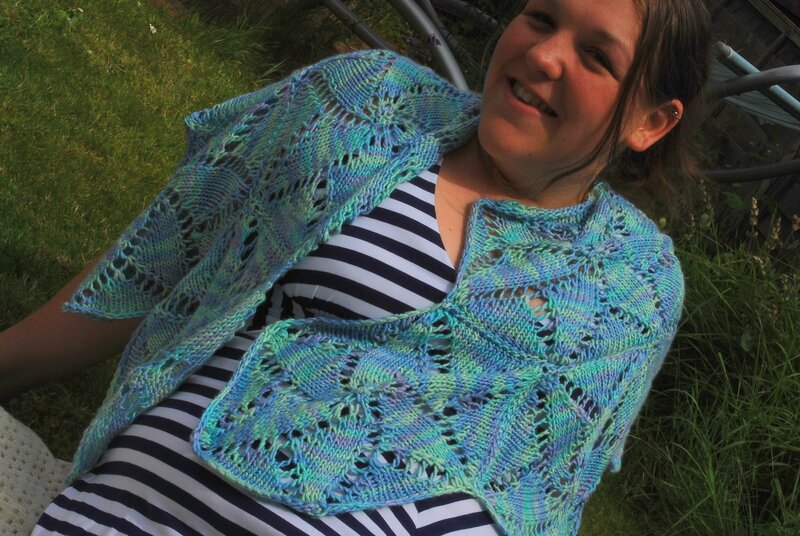 Et voila - one very flat shawl. Amazing. Every time I do it, I think it won't work, and every time, it does. Mods: None really, except I held the Snowflake tripled over when I stitched it over the instep and down the sides. I knitted the bigger size to start with and it came out gigantic and deformed, so I knitted the next one with the smaller suggested needles, and switched back down to 3.5mm when I got past the decreases, and came out with something approxiamtely baby-foot-sized. 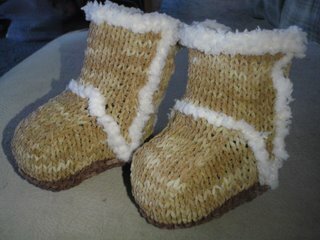 They were superquick an hour for each one, plus extra time for the stitching of the "seams". Here is Benny trying to get in on the action. They totally don't fit him. Annoying thing about this yarn is, I haven't found anywhere in the UK that sells it, or an equivalent. The shipping from WEBS was around $9 which is reasonable for transtalntic airmail, but when it hadn't arrived in 2 weeks I guessed why not - and sure enough, it got held by customs. £4ish in VAT. £8 for the privilege of the PO telling me there was tax to pay. I really, really resent having to pay the latter. 1. It's half term next week. Holidays again already. 2. I can book the plane tickets to Vegas this weekend. 3. I am going to see Jen and the new baby in Sheffield for three days. 4. The train ticket only cost me £28 return. 6. I finished the Lovely Shawl (no pictures yet, sorry) and it blocked out like a dream. Blocking is magical. 7. Next year when I teach the Cold War to year 13, I get to teach a bit about the fall of Yugoslavia, which was one of my degree modules. YEYY! 8. I can officially drive the minibus at work now, with kids in it. 9. I have just finished planning my lessons for tomorrow (which is the last official Horribleday ever) and I can go to bed now. 10. Mr Z and I are going to Portsmouth on Sunday so I get to go to the beach - even if it's raining. Oh, and bonus? I have done seven of the things on last week's to do list - and the other three aren't time critical. I love the fact everybody thought Patrick Swayze had died today seemingly due to a rumour started on Twitter (not least because it allowed a news site to print a correction stating, "Nobody puts Patrick Swayze in a coroner's"). It makes me wonder what other rumours we could start on Twitter, that might actually then become true. I'm liking the idea of, "New reports suggest UK economy is on the up again!" The bank tried to lend me money yesterday when I paid my big cheque in. "Oh, you're eligible for a loan!" they said. "We just want to tell people we're still lending." Well, since my taxes bailed you out, I should bloody well hope you are - although you'll forgive me if I decline, since I've no doubt the rate is exorbitant. I came across this today, I thought it very cool. Mr Z wondered aloud why I had missed out the middle bit and I had to explain that I had made a big loop during my mega bus odyssey in 2001. (I will leave their bit of advertising code in so you can do this for yourself if you like). I really wanted to include Idaho and Montana, both of which we sort of wandered into during our Grand Tour of Yellowstone in 2007, but it seemed to be cheating a little, especially since my trips to the Carolinas were little more than layovers during flights. I figured it's a trade off. I got my cheque through from the insurance company last week (FINALLY!) so I can book this summer's America trip starting on Friday. Can't say we'll be adding any more states to it - maybe Oregon and Idaho, if we get that far north. The main focus this year, though, is camping in Yosemite; and white water rafting. I am DEFINITELY going white water rafting this summer, I've always wanted to do it. In case you were wondering, I do have a weekend FO but I only took it off the blocking foam after it got dark tonight so I don't have a nice picture to post. 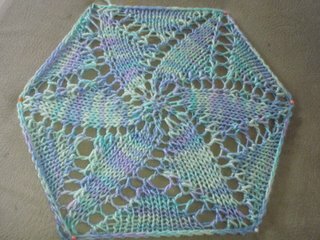 It's the pretty pinwheel shawl. Hopefully there will be pretty pictures of it tomorrow. Ooops. I totally forgot yesterday. Here's why. 10. Get some sleep. This is an ongoing to-do item. After half term when exam classes go is going to be BLISS. Finally! It is complete! My longest-running project to date! Well, it's just spring on a bamboo stick, isn't it? Needle: The bag was 8mm. The flowers and branch took 3.75mm and 4mm DPNs respectively. Yarn: All Cascade 220 - held double for the bag, which is the only patterndeviation in colour: I bought heathered turquoise instead of plain, because I like how the heathered colours have a little extra colour which pops out when felted....in this case, pink. Mods: None, really. I didn't sew on all the flowers because it was looking very busy. I didn't check gauge and had to felt three times in the machine (plus the arduous hand-felting attempt as detailed here) to get the bag to a workable size. 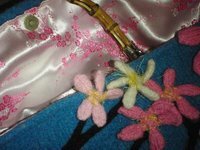 I lined it with some cherry blossom brocade I bought about five years ago for no reason other than I adored it. 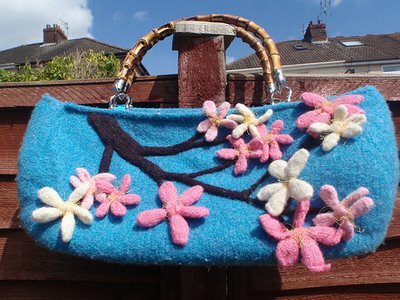 It goes really nicely with the bag, although I did make a bit of a pig's ear of sewing it in and it's a bit wonky around the top. I got the bamboo handles from here - they arrived, along with the bag feet and the magnetic snaps, on Saturday morning, after I'd ordered them late on Thursday night. I was most impressed. I attched them with some turquoise tabs made from ribbon I bought last year - that might have been the nicest part, actually: seeing all these elements I have been collecting for such a long time finally come together. I really like it. I'm sorry I waited an entire year to finish it, particularly since the too-big problem was so easily fixed when I finally figured out that I could just refelt the damn thing. Last year, I participated in a challenge on an American blog dedicated to promoting the locavore movement (click on the picture to visit the blog). Basically, it involves making one meal a week from ingredients all sourced from within 100 miles of your home, and then posting about it on your blog. Who can forget the star shaped scones or deeply unpleasant looking wholemeal gnocchi with rocket pesto I made last year? - which may have looked gruesome but was actually one of the tastiest meals of the challenge. I am going to have another go this year, although it might be slightly more challenging now that I am following Slimming World....though, meals almost wholly of vegetables are most certainly encouraged by them, and very easy for OLS too, so we'll see. The challenge begins in the last week of May - it runs from Whitsun to August bank holiday, so look out for pictures of food, coming soon. 1. Yarn. Nice yarn, in pretty colours and very pettable. This has become guilty since I've now stashed several miles of the stuff, therefore I don't need any more. 2. Ben & Jerry's - especially the Baked Alaska one. 4. Books. They don't even have to be novels - any books will do. 6. Having my hair washed and blow dried. I love doing this. It's a very rare occurrence, because it's quite an expense for something I could do myself that only lasts a day or two. 8. Leaving my computer on all the time. So eco-enemy, but so convenient (incidentally, though, I am typing this on Mr Z's computer as mine is switched off). 9. Long baths with lots of Lush products in. 10. Being subversive at school. I admire the boat rockers, but can't quite bring myself to be public. So I try and be subtle and then feel secretly pleased and guilty when my plans pan out. Basically, if I spend over the odds on something, I feel bad. It must have something to do with my upbringing, because it's not like I'm dragging out a credit card every time, and I do work (relatively) hard for my money. I suppose it's that nagging voice in the back of my head telling me to pay off my debts and put aside for the inevitable rainy day. I have fallen hard for some yarn and a project. I have been "visiting" the Lion and Lamb in the Georgetown colourway for at least a year now. Every visit to Get Knitted brings me over there, and I pick it up, ponder what I might make with it, marvel at how attractive I find the pastels when I'm not a pastel person, lament the high cost, put it back, and then repeat each time I go in. Two Knatterers' meetings ago, I cracked and bought a skein. It was a particularly nice dyelot with quite a lot of lilac in it. I checked all the other skeins - same dyelot. How much of it can they realistically sell? I reasoned. 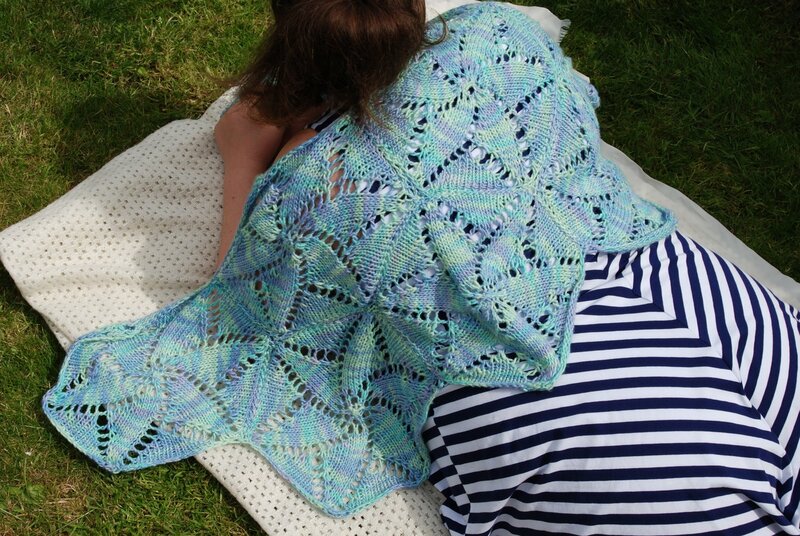 I'll buy one skein per visit and make a clapotis, I decided. This Saturday - disaster! I went to visit. Three skeins in my favoured dyelot. More skeins in an alien dyelot, sadly lacking in the lilac hues which had drawn me in. I couldn't chance it. The other knatterers suggested putting some by for next time, not realising that I wouldn't have been paid again by next time. I think you know how that part of the story ends. Then, to find the perfect pattern. I decided I had better knit something out of one of those magazines I have been stockpiling, instead of a clapotis (it's nice, but a bit meh, and I already have one). I settled on the pinwheel capelet from the winter 2007/8 edition of Vogue Knitting, not really expecting it to be anything more than average - after all, the beautiful yarn was the focus of the project. So I thought. Now, I know to you it might look just average. But this is truly the most wondrous thing I have made in some time. I absolutely love it. It's my favourite yarn - so so soft, and with a lovely sheen, and a comforting smell that reminds me of knitting the clapotis and wearing the clapotis on our trip to Blackpool last year and being warm and happy. It's a colourway I can't stop staring at. AND THE PATTERN HAS A STAR ON IT. And better than that, it's constructed of seven (though I will probably make nine and change the construction a bit) of these delightful hexagons, each of which takes under two hours to knit. This is knitting at its best. Apart from the tedious seaming, it's perfect, because I get the satisfaction of finishing something quickly, even when it's only a piece of the project. The bind off is proving to be a little problematic, true. First, I bound off using the k2togtbl decrease method - but much too tightly. So, I unpicked, and bound off using the k2, pass 1st st over method, loosely, which was better (that's the one pictured). 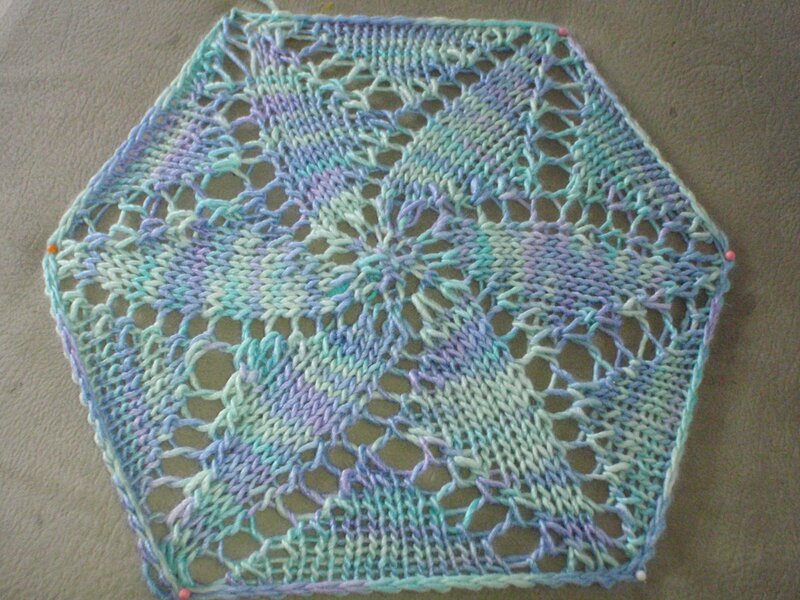 Then I knitted hexagon two and bound off using the k2togtbl decrease method very loosely, and this is the winner. I don't know yet whether I'll unpick hex#1 because if I only join it on one side I might get away with it...we'll see. A lot of people report a problem with tight bind off, but it's only to be expected, since the bind off row is basically the longest row in the pattern, and has to contain all the other knitting and stretch to allow the lace to be properly displayed. That's a lot to ask of a bind off row. In fact, the pattern could be slightly better if it was knitted from the outside in instead - but that would undoubtedly affect the look of the lacework. So much for my knitting in May plans. I was going to start a complicated lace shawl from Victorian Lace Today. I was going to knit a summer top out of bamboo. I was going to have a go at knitting the design I've got in my head. Instead, I am obsessed with something pastel. It's funny how things go. It's been a good bank holiday weekend, incidentally - Ben and Kirsty came to visit and we had a barbecue and played all sorts of games on the Wii, but mostly MarioKart. We very successfully barbecued a huge piece of pork and ended up with crackling and everything. And today I finally managed to finish marking the business studies coursework. Woo hoo!